In British Columbia’s Renewable and Low-Carbon Fuel Requirements Regulation, “Energy Effectiveness Ratios” (“EERs”) define the relative energy efficiency of using an alternative transportation fuel versus a conventional one. For example, an electric vehicle uses much less end-use energy than a vehicle powered by gasoline or diesel while performing the same task. The EER is used to calculate the greenhouse gases avoided when using an alternative transportation fuel and to allocate credit towards compliance with the regulation. EERs are also used for similar fuel regulations in California and Oregon. The current EERs were defined in 2012, likely based on the ratios used in California at the time. The current EER for the substitution of diesel with electricity is 2.7. This research indicates that there is significant variation in this EER, depending the vehicle or equipment in question. An EER of 2.7 is appropriate for marine applications, such as shore power, but should be closer to 5.0 for buses and trucks operating in urban environments. This research also considers cargo handling equipment at ports, marine propulsion, airport ground support equipment, trolley buses and transit rail. The current light-duty vehicle EER for the substitution of gasoline with electricity is 3.4. This value is based on the comparison of the 2011 Nissan Leaf and Versa and the 2011 Chevrolet Volt and Cruze. An EER of 4.1 weighted by Canadian sales is calculated for 2017 and 2018 model-year vehicles, indicating that the original EER is too low. 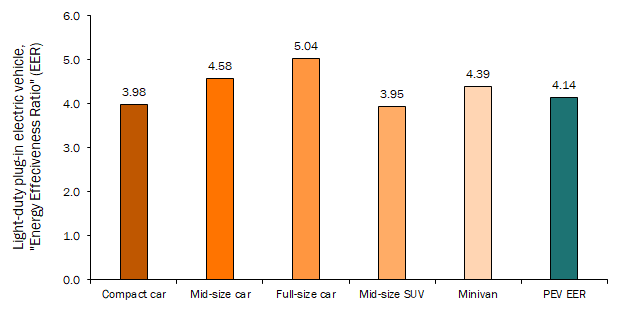 The Canadian sales-weighted EER for light-duty vehicles is 4.1 (applies to the gasoline/electric substitution). This study was commissioned and funded by Powerex.